This is a good, solid kettle. The size may make it a bit difficult to use on a conventional cook top (especially one with a hood). I have found that I can get by using a step-stool to stir/mash. The kettle heats evenly and quickly. 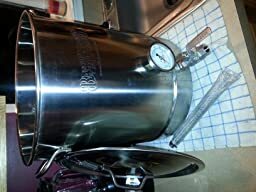 The built in thermometer provides an ideal set-up if you are using this as a mash tun (which I am). The package arrived in good condition. It may be noteworthy that there is some assembly required as the valve and thermometer unit must be installed. I highly recommend that you assemble and check for leaks before using. It took me about 3-4 attempts at tightening the joints before I had a good leak-free setup. This is super easy to disassemble for super easy cleaning. Now, I did notice a couple design flaws with this kettle. 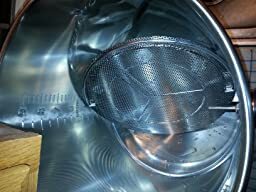 The false bottom (which comes in handy for mashing) sticks out a good inch and a half from the inside wall and the false bottom cannot fit around it. That means every time you want to install/remove the false bottom, you have to remove the thermometer setup first. EDIT (May 20, 2015): Apparently I did not pass grade-school geometry. It is possible to remove the false bottom without removing the thermometer. It does take a little maneuvering, but it is possible. Rather than messing with the false bottom, I find that the bazooka screen does a great job filtering out solids from your mash. The thermometer is installed at about the 4-gallon mark. Another design flaw that was noticeable was the height at which the valve was installed. If you leave the kettle on a level surface, there is a good half-gallon that remains in the pot. Tipping the kettle towards the valve can circumvent this. The valve itself is installed at about the 1.5-2 gallon mark. Overall, this is a great setup to get started with all grain brewing. The price and quality are great. Since it has the thermometer, it can double as a mash tun as long as you babysit the burner. Additionally, you may want to consider buying a barb to install on the end of your valve so that tubing may be used. A 1/2-inch male NPT barb and some tubing are not included in this kit and must be bought separately. You also may want to buy a mash paddle or long spoon to stir with as the height of this kettle is enormous. I did not have much success with the standard length wooden cooking spoons. EDIT (May 20, 2014) Changed Rating to 5-stars. Arrived as advertised and in a timely manner. Some assembly was required – the pot had two holes in it: one for the thermometer and one for the valve. There were instructions, but they didn’t cover where to put the rubber O-Rings. There was also a plastic device that was some sort of ball bearing thing that I never figured out what to do with. This is probably obvious, but make sure that you test it for leaks with water before you use it on the stove. You wouldn’t want to be dealing with hot liquid leaking out of the thermometer and/or the valve. The thermometer is too high when mashing. A 10lb grain mash with the corresponding 2 1/2 gallons of water doesn’t reach the thermometer probe. The drain valve is high such that over a gallon of liquid remains in the pot when the pot is level. You have to “tip” the pot to drain the remaining liquid. I don’t see that there was any real alternative that could have been done. The drain valve has a small lock that I found took some getting used to. Like others have said the fitment of the thermometer and ball valve take a little bit of tinkering to get right, expect some very small slow leaks at first, test with water initially to ensure you have everything sealed well. Finish and looks are amazing. Thermometer is top notch and can be calibrated if it is slightly off. over all great product. Well worth it.